Sunday: Welcome to C’est la Vie! A traditional champagne welcome and introduction to the crew awaits you, before your first gourmet dinner aboard. Morning cruise to the village of Ancy le Franc, which will allow you time to walk off breakfast of locally baked croissants and other pastries. After a buffet lunch you will be driven to the Cistercian Abbey of Fontenay founded by St Bernard. Dating back to the 12th Century it is listed on the Unesco World Heritage site. Returning to the “C’est La Vie” for dinner. You can walk or be driven for this mornings visit to the gorgeous Renaissance chateau of Ancy le Franc. Renowned for its 16th-century wall paintings and frescos (which are said to rival Fontainebleau), Ancy-le-Franc has been extensively and sensitively renovated. Morning visit to the medieval town of Noyers. Where you can walk through the cobbled streets enjoying the local market and discover the old ramparts and half timbered buildings from the 15th/16th centuriesalong the banks of the river Serein. Drive back to the “C’est La Vie” through fields of wheat and grazing animals for lunch and an afternoon cruise on the Burgundy Canal to Tanlay now lined by poplar trees, a perfect moment to put on your walking shoes and explore the towpath and small villages along the way. We take a morning cruise and pass through the old town of Tonnerre with buildings from many eras, including Roman and Medieval, before our afternoon visit to the town of Chablis, where you can taste some of the famous white wines of this region in one of their local cellars and enjoy a drive through vine yards which cover the hill sides for as far as the eye can see. 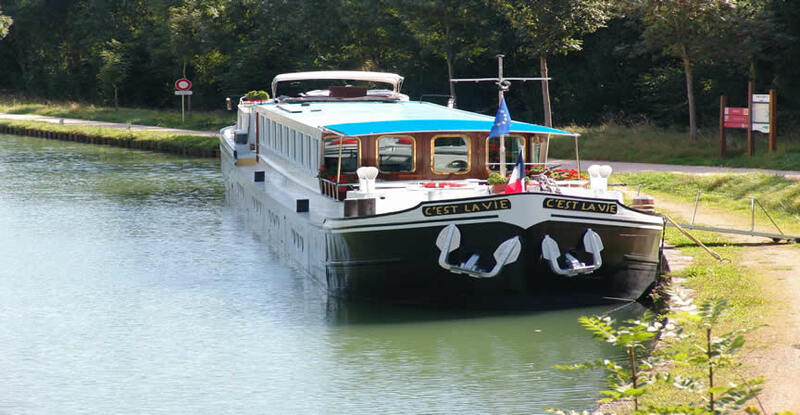 This morning’s cruise will take us to the town of St Florentin by early afternoon. After lunch drive to the town of Auxerre. On the banks of the river Yonne this historic town, first settled by the Romans boasts a Cathedral, an Abbey and a Church. With buildings dating back to medieval times this is the ideal place to stroll along its narrow streets and window shop or just sit and relax with a coffee in one of its many cafés reflecting on Napoleon, Joan of Arc or Charles VII who all passed through this elegant town. Return to the “C’est La Vie” for the Captain’s Dinner, which ends your cruise in style. After breakfast, you’ll be chauffeured back to Paris for the end of the morning. Please note that the cruise itinerary alternates direction each week.